A component is a named group of entities, which can be inserted into a drawing with BmInsert command. Components can be parametrically driven, use them in BricsCAD BIM to model entities like windows and doors and as the foundation for assembly modeling in BricsCAD Mechanical. A component can be any .dwg file. A component can be inserted once or several times into one or more other components. If the component is modified, all inserts of the component will reflect these changes automatically. Components cannot be self-referencing. A component insert is a named entity, of which the default name is composed of the name of the component and the serial number of the insert. Internally a component insert is represented as a reference to an anonymous block or an external reference. Properties of inserted components, including their parameters can be seen and edited with Mechanical Browser or Properties panel. Components can be either local or external. A local component is stored in the .dwg file with the assembly. An external component is stored in a separate .dwg file. When the corresponding .dwg file is modified all inserts of external components can be updated using BMUPDATE command or Mechanical Browser context menu. If you use external components in your assembly, always remember to transfer all related files when you want to share your model. Use the ETRANSMIT command to create a package of a drawing file and all its dependencies, such as external references, images, font files, plot configuration files, plot style tables and font map files. You can always convert a local component to an external one and vice versa. To edit a local component, it first needs to be converted to an external component using the BMEXTERNALIZE command. Alternatively, you can use the BMOPENCOPY command to open a copy of a component, edit and save it, and then use the BmReplace command to replace the original with the copy. Type BmExternalize or BmLocalize in the command bar. When you convert an external component to local, the .dwg file with the component definition is not deleted, but its future changes will not affect your assembly. BricsCAD allows users to make parametric changes of inserted components at the assembly level. A component is considered parametric if it contains at least one 2D or 3D dimensional constraint or an associative array with an expression. BricsCAD automatically maintains associativity between the definition of a parametric component and its inserts. So you can open the parametric component for editing, modify its geometry, save it, and then execute the BmUpdate command to update the mechanical structure of your assembly see the result. If you need to go back to the default value of a component’ parameter, just edit the Expression field and delete its content. Off: Hides the parameters at the assembly O. On: Makes the parameter visible at the assembly level. Auto: Hides all parameters which values are controlled by expressions, and exposes all other parameters. You can associate units with a parameter. If you assign a value, directly or via an expression, to a component parameter at the assembly level, it is automatically converted from drawing units of the assembly drawing to the units of the parameter. Values assigned to unitless parameters are not converted. By default all parameters are unitless except parameters of dimensional constraints and parameters, which are used as expressions for dimensional constraints. 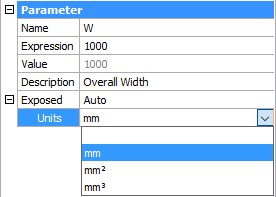 BricsCAD automatically assigns drawing units to such parameters. When a parametric component is inserted in a model, you can edit the parameters either in the Mechanical Browser or in the Properties Bar. Expand the Parameters node of the component. In the Parameter section, type a new value in the Expression field. Select the component in the drawing. Expand the Parameters settings group. Type a new value for one of the available parameters. In the Properties Bar always the current value displays. In case this value is controlled through an expression, the expression will be overwritten by the newly entered value. 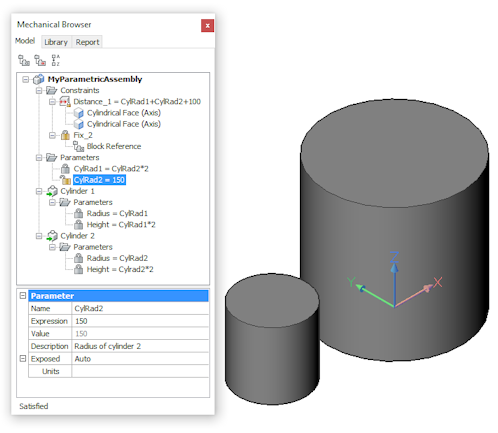 If multiple parametric components are selected, the shared parameters can be edited simultaneously. The settings fields of parameters that currently have different values read *Varies*. Component inserts can be replaced with another component using the BmReplace command. Only top-level inserts can be replaced. Click Replace Component tool ( ) on the Assembly ribbon tab. The tool is available on the Assembly toolbar and in the Assembly menu. Right click on the component insert in the Mechanical Browser and select Replace... or Replace all inserts... in the context menu. Hover over a component insert in a drawing window and select the Replace tool ( ) in the Quad menu. Type BmReplace in the command bar, the File open dialog displays. Select a .dwg file for the replacement component and press the Open button. Yes : Replace all inserts of the same name. No : Replace the selected insert only. Parameter values which are shared between the replacement component and the replaced component are copied automatically, which allows intelligent replacement of parametric components. Drawings with blocks and external references can be converted to mechanical assemblies: block references are converted to inserts of local components, and external references are converted to inserts of external components. 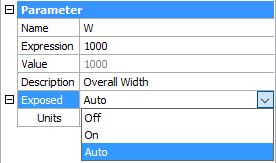 Click the Initialize Mechanical Structure tool ( ) in the ribbon tab. The tool is also available in the Assembly toolbar and in the Assembly menu. Type a name for the mechanical component or press Enter to accept the current name or the default Component_1 name. 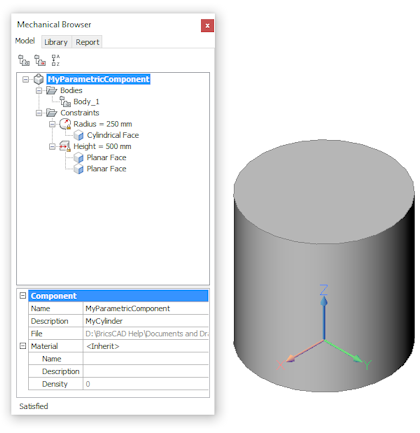 Press Enter to convert blocks and external references to mechanical components. Mechanical components can be converted back to blocks and external references. Click The Remove Structure tool ( ) on Assembly ribbon tab. The tool is also available in the Assembly toolbar and in the Assembly menu. Type BmUnmech in the command bar. Convert external components to External References (Xrefs). Convert local components to blocks. A feature is a physical constituent of a part, which has engineering significance. Examples of features are holes, ribs, slots, pockets, forms. Being applied to a 3D solid, a feature removes and/or adds some volumes to it. You can create your own features using BricsCAD component extension technology. All 3D solids located on BC_SUBTRACT layer of the component are subtracted from the target 3D solid. All 3D solids located on BC_UNITE layer of the component are united with the target 3D solid. All faces created after these Boolean operations form a component-based feature, which is updated when you change the component insert – by moving it along a target 3d solid or by modifying its parameters, if the extended component is parametric. When the insert is deleted, the feature is deleted as well. Some examples of parametric component-based features are included with BricsCAD. You can use them as samples for creating your own features. A mechanical component may have an assigned physical material. Select the root component in the Mechanical Browser. Select Material property and press the Browse button ( ). 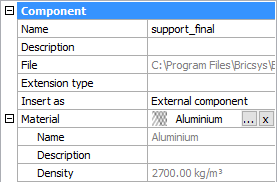 In the Physical Materials dialog select a material in the In Project or the In Library list. If a material from the In Library list is chosen, it will be copied to the In Project database automatically. Click the OK button to save changes and to assign the selected material to the component. If a mechanical component does not have an assigned material, it will inherit the material from its parental component. If the parental component also does not have an assigned material, the material of the closest component with an assigned material in the hierarchy will be used. It means that you can assign a material to several components having a common parent at once by assigning the material to their common parent component. If you insert a mechanical component into a document, all materials used will be automatically copied to the document material library. Only materials assigned to the components will be copied. However, if the current document already has a material with the same name, this material will be used instead. It means that the properties of the material defined in the document library will be used rather than properties of the material from the inserted component. Materials which are copied to the document material library will not be erased in Undo operations.